"No one has more authority to write on these matters than the husband-and-wife team of Stanford biologists Paul and Anne Ehrlich. For decades now they have been documenting and warning of humans' effects on the environment. Their new book, The Dominant Animal, continues their chronicle of the damage we have done to our home…. This is an important book,with much information and some really stimulating ideas. We need to build on these ideas, because the world is in an environmental mess and things are not getting better." "[The Ehrlichs] argue clearly and convincingly ... this fascinating, inspiring book [deserves a] wide audience." "…The Dominant Animal tells the story of how mankind came to dominate nearly every inch of the earth. [It] spans the entire history of the world, weaving both cultural and biological evolution into the ambitious narrative. At its core are timely questions we would all do well to consider: Is it in our best interest to dominate Earth? Are we creating a future we want to live in?" "While the world suffers from natural disasters, inflated energy costs, and unsustainable consumption patterns, the Ehrlichs make hopeful suggestions for sustainability and reduced vulnerability." "Alpha male and female of contemporary science ... the Ehrlichs convey a message at once chilling and hopeful…. The big ideas and the tenor of The Dominant Animal are right on. The book rejects starry eyed insistence on new technology as humankind's savior in favor of socially responsible, if admittedly difficult-to-enact, prescriptions." "Their latest book, The Dominant Animal: Human Evolution and the Environment, continues to drum home the message that humans are on a collision course with ecological catastrophe. But what's new and notable is the dual biological and cultural lens the Ehrlichs use to diagnose the underlying cause of our predicament... the book left me wanting more—hungry for revolutionary new insights whose very existence would shine the right way forward. If we'd listened to Ehrlich 40 years ago, perhaps we'd already be on that path." "Covering a vast swathe of disciplines, from genetics, evolution and ecology to climatology, economics and global politics, the book almost reads like a primer for the concerned citizen.... This marvellous compendium should be required reading." "The Ehrlichs, in The Dominant Animal, cover an enormous amount of scientific ground in looking at both the big picture in terms of environmental dangers and challenges while also offering detailed explanations of how humans have evolved, both genetically and culturally, within our environment. The book relates precise science in easily understandable terms." "Buy this for your next seminar class.... or be inspired and make an undergraduate course out of it...Yes, you've read some of this before, but not all of it, and not told so well, or with such passion and humor." "One of the essential books of 2008.... The Ehrlichs walk you through a basic course in evolution and genetics before moving into a cultural evolution and its devastating impact on ecosystems, worldwide." "In The Dominant Animal, the Ehrlichs step back and analyse the big picture, looking carefully at how humans have evolved to dominance and, in the process, are laying waste the planet. Their message is that our technological advances aren't matched by how well we treat one another or the environment around us." "Imagine a UN Millennium Assessment of Human Behavior! This an important and sobering work…"
"Is there an armchair scientist on your gift list? 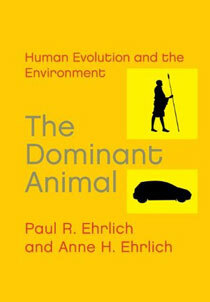 Then you can't go wrong with The Dominant Animal: Human Evolution and the Environment by Paul R. Ehrlich and Anne H. Ehrlich. This fascinating book is not for a lightweight; it's filled with hypotheses, insight and ideas for thinkers. This is a perfect gift for someone who loves to study culture, but will also be a great for anyone who's trying to 'go green' this year." "This sparkling book is a great guide to what's essential about humans, the world, and how they affect each other. Along the way, you'll pick up delicious tidbits such as what Mussolini's basic problem was, and why we are so sure that tiny sequoia seeds grow into 300-foot sequoia trees even though no one has ever seen it happen." Jared Diamond, Professor of Geography at UCLA and author of "Collapse" and "Guns, Germs, and Steel"
"No other scientific couple could produce a book of this brilliance on where we came from and where we're going. The Ehrlichs, who have been at the cutting edge of the science, have interwoven evolutionary history and our environmental dilemma into a compelling and vital story." "This is a grand tour of the current state of ecological science, and a tour de force of observation, insight, and suggestion." Bill McKibben, author of "The Bill McKibben Reader"
"This is a brilliant and fascinating account of how we became the planet's ruling species and now the major force determining the future of evolution. The Ehrlichs' broad perspective and lucid prose bring fresh understanding to what's going on in the world today. Everyone should read this book." "Best of 2008 Sci-Tech Books"
Chapter 6. Perception: How Much Of The Outside Gets In? Chapter 16. Energy: Are We Running Out of It?